Could Gadget Prove a Deterrent to Package Theft? Package theft is a growing problem - and it can hit online sellers hard if it happens to one of their customers. How many times have you heard reports of buyers claiming to have never received their package despite the carrier showing it as delivered? Even though theft from the customers' property may be a tiny fraction of such cases - the fact that the problem is growing is worrisome. "Mike Grabham, who runs the Startup Grind speaker series in Seattle, today launched a $45,000 Kickstarter campaign for a new invention he's dubbed Package Guard. "The size of a frisbee, Package Guard is a Wi-Fi-enabled device that sits on front porches, alerting a customer when a package has been delivered to their house and, more importantly, setting off a loud alarm if anyone unauthorized tries to steal the package." You can read all about it on Geekwire. You have to wonder if shipping carriers are working on their own inventions and solutions to the problem. Let us know what you think of the idea, and if you have any suggestions of your own on how to reduce "front-porch shopping." He should take his invention to the Shark Tank. It sounds like something that could be licensed. Stupid idea! They will just steal the Frisbee looking device with the package!! ROFL! ''You have to wonder if shipping carriers are working on their own inventions and solutions to the problem.'' I'm not wondering ... they/carriers have already ''thought'' of an invention, that works ...it's called Signature Confirmation. This guy isn't offering a solution to anyone. He's asking people to buy his disc which wifis them a USPS or other carrier has scanned a delivery that's left at their doorstep is redundant. And a thief can still steal the package and run with it knowing neighbors are numb and conditioned to ignore alarms. Disc or no disc if it's stolen it's gone. And if the disc homeowner wants to fraudulently claim ''a theft'' ...they still can and easily win a chargeback claim. His product offers no prevention against porch theft. I offer my eBay buyers free SC if they need/prefer to sign at delivery, Few request it which means 1. They view re-scheduling an easy re-delivery/or picking up at their local post office within 2 weeks including Saturdays is ''a bother'' or they're not too worried of postal theft. Online sites can easily address this postal theft by adding SC as an option to their buyers at checkout. It costs $2.85. Let the buyer decide if they want, need or prefer it. This solves the porch theft problem. Finally, If this guy thinks a USPS or other carrier is going to carefully place/stack packages on ''his disc'' then scan a package twice ...he needs a reality check. But then again he's probably dreaming of making multi-billion$ based on the billion$ online buying stats and a disc at every home in America and beyond. The reality check again, $2.85 SC is the only safe and secure proof of delivery needed to prevent postal theft. P.S. I require buyers include insurance and signature confirmation on all returns to me to assure the return was received and signed to protect against postal theft. Twice last week an Amazon van made deliveries to my home, rang the bell and asked my first name to place into their scanner. Perhaps they finally are making an attempt to combat the dishonest buyers who claim no receipt. "setting off a loud alarm if anyone unauthorized tries to steal the package"
Thieves don't care about alarms. They'll be long gone before the police or anyone else responds. Smash and grabs prove this. A simple metal lock box bolted to the porch would work better. Agree with @Trying-My-Best above. Recently found out that there is an in-person pickup service at USPS. eBay does not offer this option in its "mail type" menu, but I'm offering my customers the choice of using that service to pick up their pkgs if they don't want to take a chance on "front porch" theft. 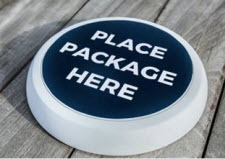 That way, if they refuse my offer, I can show that it was offered as a free service to them - in the event that they claim they didn't receive their pkg marked "Delivered at Front Porch." dem, while I'd prefer not paying the $2.85 for my buyers who need or prefer safe secure delivery ... since eBay doesn't offer this service to ''their buyers'' as a simple option to guarantee the best buying experience, it's the least I can do for my buyer and myself in case a return is made. What's good for the goose is good for the gander. I strongly suggest sellers who accept returns to include in your return policy your returns are required to be mailed including insurance and with signature confirmation for a refund. I also require buyers to upload 2 to 3 photos showing the item condition before they mail the return back to me and quote eBays announcement page on how photos uploaded help resolve issue of condition once item is received by the seller. No photos and or no signature confirmation means no refund. Insurance protects against postal damage and can be filed by either the buyer or the seller. Speaking on insurance and knowing its available for original shipping labels on the site ... eBay return labels doesn't have a drop down menu to add insurance for returns. Again, a basic service. My policy clearly states buyers are not to print ebay return labels as required insurance and SC are not available on eBay site. I've told CS, Resolution and Trust & Safety that eBay needs to have at least an insurance drop down for return labels but have yet to see them add this simple widget to returns. This means eBay considers seller stock worthy for these basic services for buyers but not for sellers accepting returns. After losing a $600 claim last year due to a scanned delivery that was not at my porch when I arrived home ... eBay forced a full refund on me. I went to a very specific return policy. Funny thing in November I actually caught a postal theif - it was actually the USPS Carrier. He scanned delivered a Priority Mail package to my daughter in NYC at 8:30pm on night. She was home all day and night. My phone call to her local post office had their rep admit ...the time scanned was odd as she saw the carrier ''clock out'' at 6pm that day. It took her post office 3 days to finally re-deliver the package and it was finally delivered at 9pm - 3 days after the 1st scan. I can only guess the carrier either forgot to deliver the package and discovered his mistake when clearing out his truck or his intent was to steal the package. His supervisor gave it a scan, against the rules, because they are required not to have any packages at the end of the day. They tried to pull a fast one and fumbled badly. Just know it's a reality and can happen to you on returns as well as to your buyer mailings. Sorry to be long on this ...but I recently received an eBay purchase (purchased from an eBay exec) that was scanned at 6am - hours before - mail trucks left their branch office!!! I received that package at noon, my regular mail time. I wonder what ''my eBay seller'' would have done for me if I had claimed the item was not scanned ''at delivery'' and if it had never been received. Chances are he wouldn't believe me. SC is the only real proof of delivery and will protect you from not only porch thieves but also carrier theft. > a full refund on me. I went to a very specific return policy. ...which I'm afraid you will find to be completely unenforceable if push comes to shove, and another buyer files a dispute. eBay/PayPal policy trumps yours, no matter how officially you word your rules in your descriptions. While you can diplomatically _ask_ buyers to insure the return shipment, you cannot require them to do so. You cannot require them to use Signature Confirmation either, although it might be interesting to see whether a failure to do so on a return shipment of over $750 in sale price would mean that you wouldn't have to refund upon receipt, as they _technically_ could not prove delivery that way. However, for a $600 shipment, Delivery Confirmation tracking showing a Delivered status will suffice for proof of return. Trying-My-Best writes: "[N]eighbors are numb and conditioned to ignore alarms." I agrees. Unless the inventor scraps the alarm and instead has the device yell "Stop thief!" I don't think this would be much of a deterrent to porch shoppers. A better solution would be to install security cameras on the front porch so you could at least turn the video into the police and possibly get your items back. Rexford also has a good idea with a lock box on the porch, though it would be impractical for letter carriers to have keys to all the boxes. The lock box would almost have to be tall enough that once the package was inside, no one else could reach in a grab what was in the box. Easy pickens , is easy pickens. The best laid plans of mice & men. Theres little to be done with this issue. Widespread , every town , free stuff to criminals. I dont see an end in site , anytime soon. Most dont care about cameras , alarms or the like. Its easy prey for thieves. I have one , it would likely cost more to use , than worth. Along the lines of a bank duster. You punch in a code to open box , if not , you get dye in the face. A peel back panel , exposes a key pad , punch in code , open box. Can be used more than once , & the would be thief gets a paint job. I prefer that my items be stolen by career criminals wearing matching uniforms. The mystery is figuring out if it's the airline employees or the USPS itself doing the mauling and crushing. I rent a Post Office Box for deliveries to ensure that no amateurs wander into the process. Seriously, I doubt that any carrier's employees can be trained to actually set the package onto the Frisbee sized disk. I believe that blaming the customer for crappy service is a great marketing plan for going out of business. I can share years of experience with you: the bigger problem is that neither USPS nor UPS nor FedEx nor DHL ring the doorbell or knock on the door when they deliver packages. Same holds true for both commercial and residential deliveries. I've had hundreds of dollars worth of valuable merchandise left on the front sidewalk even though the main entry was unlocked and customers were entering and exiting my store. The same UPS employee may walk in the next day and set a package on the front counter. It seems to have more to do with how tight their schedule is than it does with the delivery address or the package. Well, so long as the stockholders are making money who gives a flip about the customers? iheartjacksparrow, I am thinking of a strong box with an opening similar to the USPS blue boxes, or a door that opens, but once package is in, the closure does not alloy for entry. Perhaps we should manufacture and market this idea. There is a definite need. Yup, your "strong box" that looks like an old USPS drop box can come with a legal kit for amending local restrictive covenants over the objections of your neighbors! Having been a victim of porch shoppers, I found the only solution was a box rental at my local UPS Store. I agree with others that, while a "cute" gadget, the disc would be unlikely to deter thieves. I have a PO box, but that, unfortunately, doesn't help with FedEx and UPS packages. I do get text alerts when something has been delivered but if you're not home at the time, it could still be stolen.